On a seaside podium in Lebanon, Halim el-Achkar locks hands with an opponent, exerting pressure until he slams both contestants' forearms down with a fearsome growl, to win the bout. His rippling biceps etched with tattoos, the 25-year-old is thrilled that the country's century-old pastime of arm wrestling has been given a new lease of life. "I always loved this game. For me, it's a symbol of strength and manliness," said Achkar, sporting a neatly trimmed black beard. "This discipline must be taken up more, so we can shine abroad the same way we do in basketball," he added. 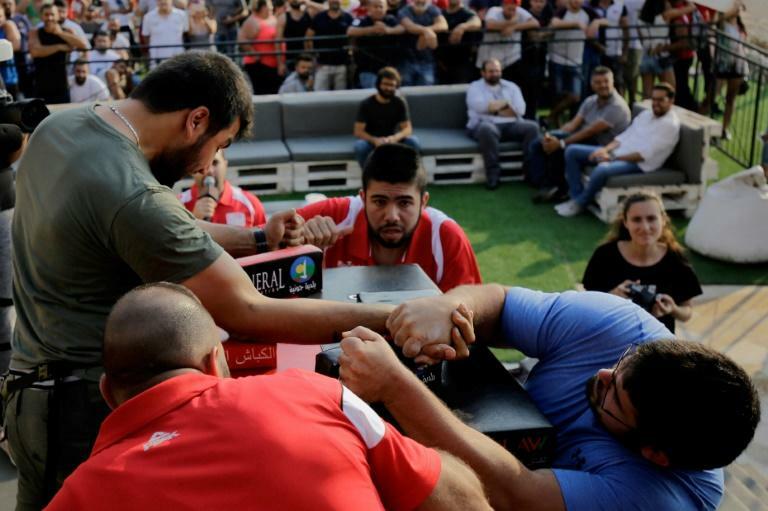 The tournament in Jounieh, a Lebanese town just north of the capital Beirut, is the second annual nationwide contest organised by the country's arm wrestling federation. Established last year, the body already boasts 750 members whom it trains to perform at international standards, founder Karim el-Andary told AFP. "The goal is to put Lebanon on the world map," he said. It's a goal that looks achievable, since two federation members scored gold medals at a competition in Italy last year. But Andary is driven by more than a quest for international recognition. 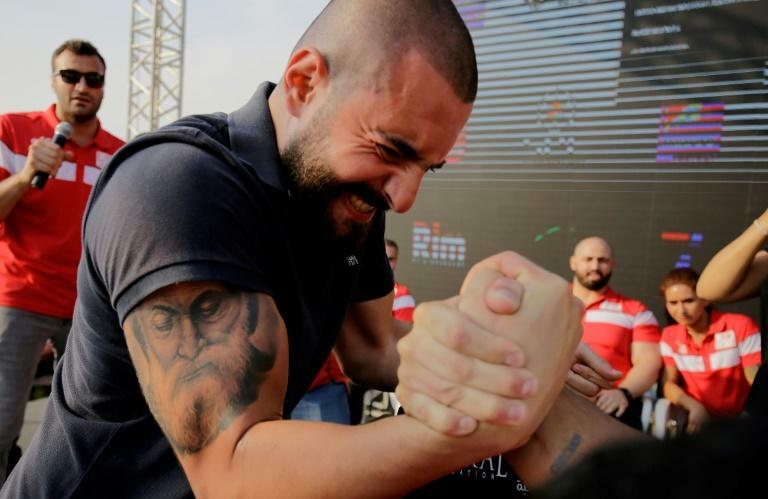 "Arm wrestling is rooted in Lebanese tradition. We inherited it from our grandparents. It's our duty to preserve it," he said. As far back as the 19th century, men in villages across the country would show off their strength, locking hands over a table -- or even just lifting rocks. "This tradition was widespread across the country," said Maroun Khalil, who heads the Lebanese Federation of Heritage and Traditional Sports. "It was both a playful pastime and a way to resolve disputes in villages without resorting to bloodshed," he said. "Arm wrestling has been part of my life since I was a child," said Harb, competing professionally for the first time. Despite possessing bulging arms and facing a 14-year old opponent, luck was not on his side. Harb's rival -- imposingly tall and bulky for his age -- swiftly triumphed. Competitors were seeking to secure their slots in the annual national final on September 9, which will crown three champions: one in the under 90 kilogram men's category, one above that weight, and one woman. Of the 300 participants in this summer's nationwide tournament, one in six were women. And it's the first time women have competed at the national level. 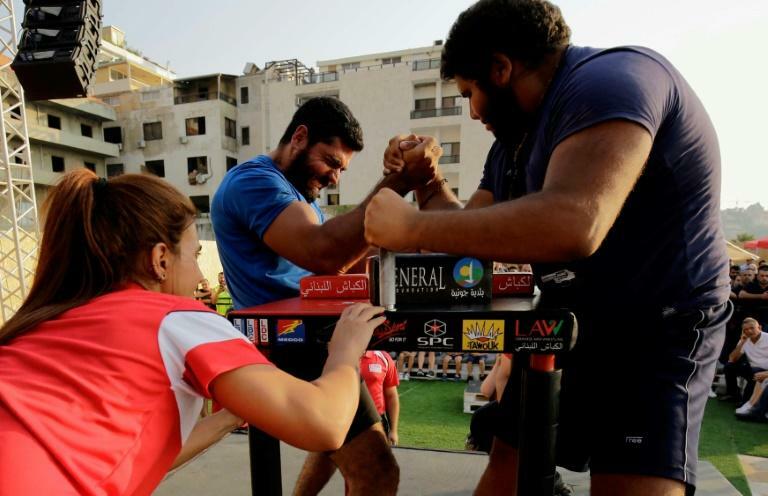 In Jounieh, Amany Abi Khalil, 22, was determined to crush the misconception that physical strength is a purely male domain. "I came here to show that women can take part in this sport without becoming less feminine," said the theatre undergraduate. "Some were surprised by my decision, but my parents and my friends supported me," she said. Claudine Aoun, head of the National Commission for Lebanese Women, watched enthusiastically from a ringside sofa. "Women taking part in this competition is a message" that they can operate in sectors previously associated with men, she said. The winner of the women's competition on the day, 16-year-old Teresa Bassil, agreed. When she stepped up to the stage for the awards ceremony, she did so among a sea of male judges clad in red. "Strength is not just a man's thing. Women too can be strong," the teenager said softly, dressed in a purple t-shirt with her hair tied back in a ponytail.